Plus, the Dallas Morning News names their candidate(s). About 10 days ago, Dallas County District Attorney John Creuzot issued a five-page memo detailing several reforms. It covers first-offense marijuana, THC possession, “trace” drug possession, criminal trespass, theft of “necessary items,” probation, the bail system, and more. Reaction came quickly, with statements against some of the reforms coming from Gov. Greg Abbot and Attorney General Ken Paxton as well as various police unions and associations across the state. But, even clarified, the reform doesn’t sit right for all. Councilwoman Jennifer Staubach Gates expressed concerns that the policy could contribute to existing problems in struggling neighborhoods. She pointed out drug dealing she says is going on near a school in Vickery Meadow. Creuzot did not appreciate that line of thinking. “Without these policies, what you’re describing is a problem that exists right now,” he said. He said he “rejects the idea” that somebody who’s hungry and poor would take his policy as a green light to commit other crimes. Preston Hollow People will get its District 13 council debate between Laura Miller and Jennifer Staubach Gates after all. D editor Tim Rogers is dressed up in his finest moderator clothes today. And all things are set: 7:30 p.m. tonight inside the Terry Center at Jesuit College Preparatory School of Dallas. Only problem being, it’s sold out. But our sister paper will be streaming it from Preston Hollow People’s Facebook page, so you can go ahead and bookmark it. You’ll recall that Gates backed out of the previous debate last month, saying that the 250 tickets had sold out so fast because people from outside the district scooped them up. (People’s William Taylor found only 12 non-district attendees register out of the 174 who provided their addresses.) Miller said Gates was dodging her. The two eventually debated at Maggiano’s in NorthPark during a Dallas Builders Association meeting, but only about 50 attended. Tonight, the community will get to see the two square off on Preston Center, infrastructure, public safety, and more. Wishing you a happy Earth Day and a merry week. Early voting kicked off this morning. Chances are, if you live in Dallas proper, you’ll be choosing a new mayor and a council member for your district. 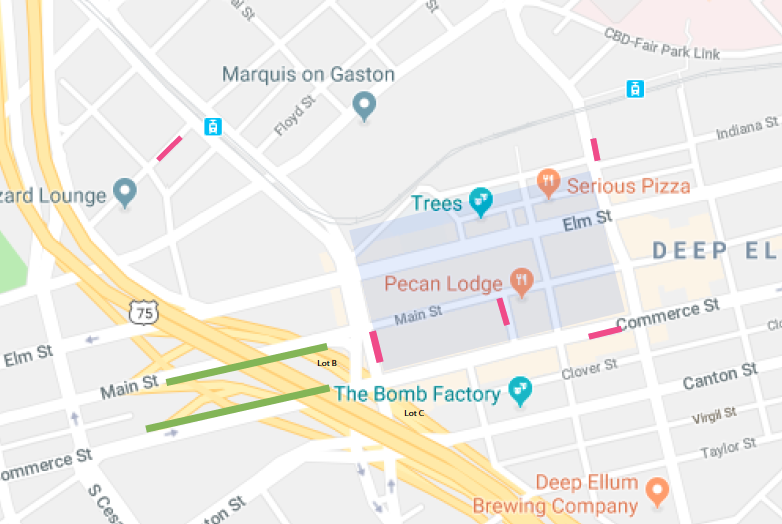 One of the issues D Magazine has explored in depth for the past five or so years is the tear-out of I-345, the elevated highway that divides Deep Ellum from downtown. If you need evidence of the sea change of opinion on this, more than half of the mayoral candidates support a tear-out along with nine incumbent council members. Challengers in 12 of the 14 districts support it, which is getting pretty close to consensus support. Over the weekend, the Coalition for a New Dallas—the super PAC that was co-founded by our publisher, Wick Allison—released the names of all the supporters. D editorial found out about it today, because the folks across the hall continued their trend of not giving it to us early. Your five mayoral candidates in support: Mike Ablon, Albert Black, Scott Griggs, Lynn McBee, and Miguel Solis. That charts with what we found out in our podcast interviews with these folks. Jason Villalba didn’t want to spend public dollars on it, and Regina Montoya expressed concern that it would add time to the commutes of working mothers. Similar removals in San Francisco, Boston, and Milwaukee showed that traffic finds its way to alternate routes without any significant delay. Early Voting Begins Today. Which means you need to find your polling place and go. This one’s incredibly important. Here is where you can find your early voting location. Here are all of our mayoral candidates. Here is the Dallas Morning News’ voter guide. Here is a story about how abysmal our turnout was our last two municipal elections, which should be enough to at least cause you to feel guilt and/or sadness, and I’m told those are motivators for some people. Let’s aim higher, folks. Storms (Probably) Begin Tuesday. We’re being punished for such a beautiful weekend. But I did just ctrl+f “hail” on this story and found only one reference, so maybe that’s good? Here is Dirk’s Letter If You Missed It. The Big German took out a full-page ad in the News over the weekend. Read it here. Pearl High Rise Sets Dallas Record. The Arts District tower set a new record by selling at $700 a square foot, which was more than 40 percent higher than the previous top-seller. And it won’t help the market. If anything, it’ll only raise the price per square foot ceiling. I spent Thursday night in Deep Ellum. This is not interesting. The power went out on the block for maybe 10 minutes during Goodie Mob’s set at the Bomb Factory and everyone was really well behaved so CeeLo Green tossed fruit from the green room out into the crowd. This is not even that interesting. The interesting thing about my Thursday night was that I lived the first night of the New Deep Ellum. I am here to tell you that the streets have been taken back. The rideshares are now all corralled in staging areas, queuing up all orderly like and awaiting to be buzzed by passengers at designated locations inside the neighborhood. Everyone knows the deal and they’re happy about it. I just lied to you. Now I’m being honest: nobody seemed to notice or care. Very little, in fact, has changed. Traffic didn’t seem too different from any other sort-of-quiet Thursday night, which is that it was moving. PD-15 Comes to City Hall. Residents in this Preston Center area Planned Development District came down to the City Plan Commission meeting on Thursday to voice their concerns about up-zoning the neighborhood to 24 stories high. This decision is why Laura Miller decided to join the City Council race, as city staff are the ones who recommended the added density. A vote on the proposal won’t come until June 6—but the PD-15 folks are watching early. State Rep. Rafael Anchia Is Taking on the Natural Gas Industry. After homes exploded in North Dallas, the Oak Cliff legislator is calling for increased pipeline safety and the removal of potential conflicts of interest between the operators and the oversight body, the Railroad Commission of Texas. He’s filed 11 bills this session, but only two have seen movement. His wishes seem understandable: operators must quickly report “major problems” with their pipes and tear out old ones. And he wants statewide evacuation protocols to prevent deaths. Easter Weekend Will Be Dry. Man, it’s beautiful outside on this Good Friday. It looks like that will continue through the weekend. Remember when it was supposed to hail? Tonight, folks in Deep Ellum will notice something different about their neighborhood. Hopefully, it’ll be that even as the tipsy Thursday crowd grows more dense, the streets will remain much clearer than they normally would. But at minimum, Deep Ellum revelers will notice that Uber and Lyft drivers are dropping off and picking up their rides at five distinct staging areas, rather than providing door-side service to the district’s many restaurants and bars and clogging the streets in the process. A perambulator who was just yelled at by cops for being so bold as to use the sidewalk in front of the Dallas Museum of Art while they are erecting tents for the Art Ball sends along this picture. Get in your car, fool! Soluna International Music and Arts Festival is approaching its final week, and the next few days are stacked with highlights. Grammy and Academy Award-winning artist Jennifer Hudson joins the Dallas Symphony Orchestra on Saturday night to perform a crowd-pleasing program including hits from Dreamgirls. On Friday, improvisational musician and artist Lonnie Holley will team up with cellist Dave Eggar and performers from the SMU Meadows POINT ensemble to explore American Landscapes, a meditation on history and Holley’s Deep South heritage. But the pinnacle moment of Soluna comes sooner–the Dallas Symphony Orchestra’s new music director designate Fabio Luisi takes the podium for the first time on Thursday and Friday. Luisi is making his debut leading the orchestra following the 10-year tenure of Jaap van Zweden. Read all about what that means right here.